Yosef Hay is a specialist in kabbalah, who works solely with white magic. He uses his connection with higher level spirits to deciphen exactly what needs to be done and works closely with them. Using white magic with kabbalah spells that means no harm or destruction and is a safe way of practicing magic which draws positive energies. Every letter or combination of letters has a certain influence on a person, an object, a body organ and on the world. In combining parchment and the Kabbalistic Hebrew letters, yosef creates a powerful tool to help you achieve the things you need most in this present stage of our life. He works on everything that seems to be blocking a person. If you want to attract someone or if that love of yours walked away without hesitancy yosef will be able to pull both of you back into the same circle and close it as one. Is someone trying to break your relationship yosef works quietly and directly with spirits and goes right into that person and brings them back and breaks the worst spells possible since white magic kabbalah is so powerful the highest purest form of work with spirits, never having to worry it will turn back on you cause all of yosef's work is for good and never to harm anyone involved even those who had cast a spell on you. Yosef success rate with relationship and to bring more money to you is fanominal..
Yosef has been taught only thru generation to generation certain secrets that will and can never be revealed to anyone as a kabbalahist this is as secret as uncovering scrolls, even when you find something it may never be defined and revealed. He can do love spells, cast love spells, break spells find work for you , increase money, heal those who suffer from illness, block anyone from being accused in court out of a court case a winner. 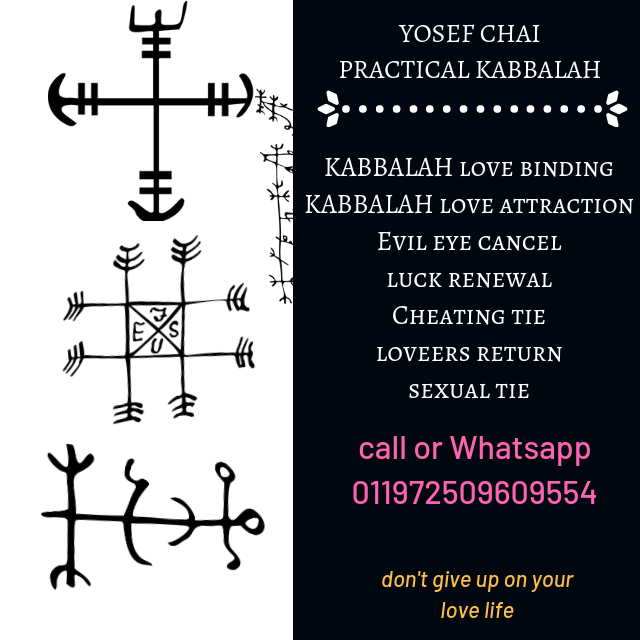 So with saying so, check out Yosef Hay and his Kabbalah White Magic, it is only a call away from achieving what you want do to those you trusted and cast a spell on you. My lost love spells will help you get back a ex-girl friend, get back a ex-boy friend. If you really loved each other but somehow things did not work out, my love spells can help you bring back that ex. Maybe you still dream about your ex-love and occassionally think about the happy times you had with your ex-love and you truly believe that they where your soul mates. If this is you I can help you bring back your ex-love in a few days with my powerful love spells that realy work. The kabbalah Love Spells is dedicated to helping people with various love, relationship and marriage problems using powerful kabbalah love spells. kabbalah's love spells will help you find love, love spells to help you stay in love, love spells to make someone fall in love, love spells to protect your love, love spells to bring back a lost love and love spells to enjoy love using his powerful love spells. I use powerful love rituals, love karma, wicca spells, love potions, love muti, love charms together with my love spells to solve any love problems. If you need a love spell or love spells to help you with any love problem email yosef hay at yosefhay8@gmail.com . Mysticism return of loved a husband or a wife, domestic peace, a man who betrayed and left. Removing the evil eye, witchcraft, jams, open the Luck for a new way and removing bad Karma, tie traitors. Talisman for success in business. "מכ"בי יקו"ק דרחיל עינה בישא דישראל "
Returns of love – what is it and how to act? Returns Love is a complex and delicate. Not always possible. sometimes lovers get lost by the will of god, and of course it is not advisable to go against his will. it is strongly recommended to check. Yosef hay Central role is bringing the students into the way of extracting personal destiny, to accompany them and guide them so they will reach the end of the elevated spiritual level or even beyond that. Legal spell magic, love spell to return a couple to strengthen love. All we have on this site address www.magia18.com is on the responsibility of the user and the opereator !